The U. S. Breakthrough Begins with the Crossing of the Roer: The Ninth Army's crossing of the Roer was a short, violent struggle against the Germans and the river. Forty-five minutes after the night barrage had begun, assault boats and amphibious tractors started across in a great wave. 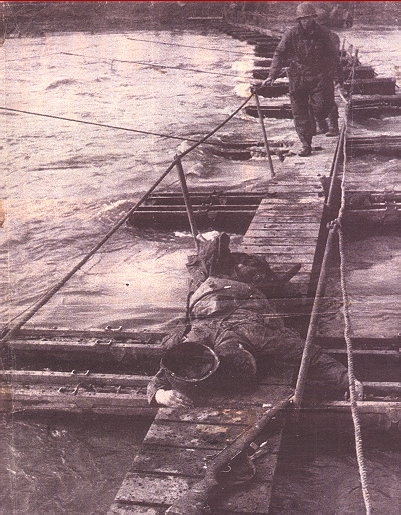 In some of the boats were combat engineers, ferrying cables to moor their pontoon bridges in midstream. During World War II, Operation Grenade was the plan for the U.S. Ninth Army to cross the Roer (Rur) river in February 1945. On February 9 the U.S. Ninth Army, under the command of Montgomery's British 21st Army Group since the Battle of the Bulge, was to cross the Roer and link up with the Canadian First Army coming from the Nijmegen area of the Netherlands in Operation Veritable, which had started at 05:00, February 8. However once the Canadians had advanced, the Germans destroyed the dams upstream. This stopped the Americans from crossing as planned. It had been anticipated that the Germans would try to do this, and that General Bradley's American 12th Army Group could capture them in time to stop the flooding. During the two weeks that the river was flooded, Hitler would not allow Field Marshal Gerd von Rundstedt to withdraw behind the Rhine, arguing that it would only delay the inevitable fight. He ordered him to fight where his forces stood. The Ninth Army was finally able to cross the river on February 23. 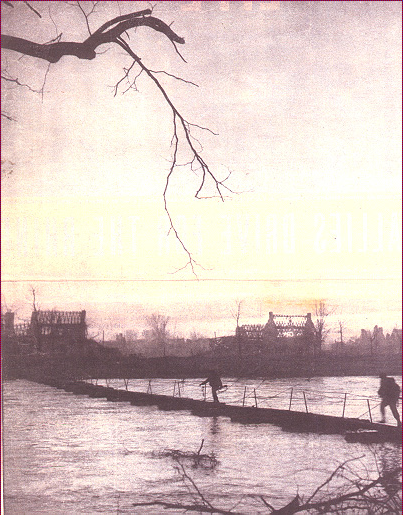 By then other Allied forces were also close to the Rhine. Rundstedt's divisions, which had remained on the west bank of the Rhine, were cut to pieces in the Battle for the Rhineland, and 290,000 men were taken prisoner.